The one place from which most of those original head-turning, jaw-dropping costume ideas evolve is from your very own imagination. So first, browse your mind. Brainstorm! 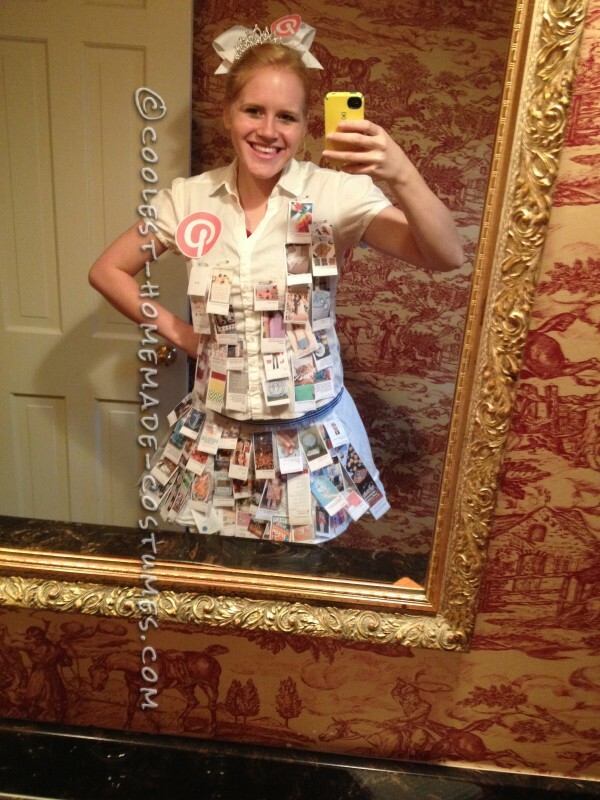 Hey, that’s a cool costume idea – why not simply BE a Brainstorm like Tracy from Washington, DC? On this page, I’ll share with you my own techniques for helping my kids, their friends, my friends and, of course, myself find the best Halloween costume idea, one that I’ll really want to sink my teeth into. After all, you’re about to invest your time, your energy, hopefully not too much money, into creating a costume. Then, you’re going to go out and spend more time making a complete fool of yourself – and enjoy every minute of it! So you need an idea that you, personally, can connect with and that’ll show a side of you that’s normally not “on display” day to day. How do You Find the Best Halloween Costume Idea? One day I was sitting with my youngest daughter, Shira, brainstorming ideas and she suddenly had a craving for popcorn. POPCORN! That’s it. 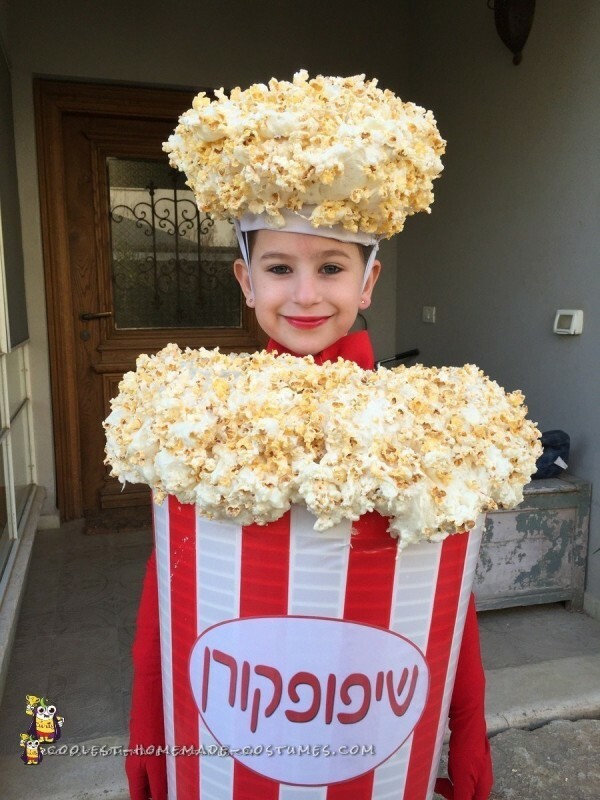 You love Popcorn, we’ll make you this coolest ever Popcorn Costume. And, we called the creation “Shipopcorn”, combining her name and our family name – Shippony – to give a regular popcorn costume that special twist. I love twists! You can take almost any “regular” costume idea and give it a creative twist to transform it into a WOW costume. Take for instance the time my eldest daughter, Maya, was 12. She and her classmate needed a last-minute couple costume. It was the night before and we were brainstorming and, once again, fending off the stress by eating… this time we were munching on pretzel crisps. They’re called “Flatties” in our country. SPARK! We got a few household items together, bought some bags of “Flatties” and the next day two twelve year-old girls went to school dressed up as… “Flatties”. The double-entendre was very self-humorous in a subtle way and it was the most original costume by far. If they would have dressed up just as “pretzels” it probably wouldn’t have had the same effect. But finding original costume ideas is far beyond strolling the aisle at your nearby supermarket. It’s sort of like strolling through the aisles in your mind and fishing for ideas. My middle daughter (yes, only daughters and living in a house with three girls and their mother is challenging no less than finding a costume idea), wanted an illusion costume. The fact that she already pinpointed illusion made it much easier. We browsed the illusion section of Dad’s site and found inspiration from this costume. Then, we dreamt up our own adaptation and started off with a skeleton morphsuit costume she had used a year earlier (I love morphsuits and in my opinion there’s nothing wrong with buying a complete costume, or buying costume accessories. You can always give a pre-made costume a twist. The costume doesn’t have to be 100% homemade to be a DIY costume. It’s all in the idea.). We figured out the illusion part, keeping it as comfortable as possible and pulled off quite an impressive Grim Reaper illusion costume. But that wasn’t the end of Noa’s costume. I also needed to come up with the best Halloween costume idea for myself. And, as always with me – it was last minute. So I took Noa’s costume, tore it apart, and turned into a Grim Reaper/Streaker Costume. It was hilarious and most of all, it was fun! I’m far from being the best costume maker (some of the costumes I see online just blow me away with the level of execution!) – I just love dreaming up ideas. Other sources for inspiration (besides food…) can be movie characters you love, TV characters, or even a trending youtube character like the Double Rainbow Man (Oh My God!). Current events are excellent sources of inspiration for original costume ideas, too. And then there are all those inanimate objects that are just laying around – like, for instance, a “Guess Who” boardgame or maybe the sparks from the bug zapper will be the spark for your next contest-winning Bug-Zapper costume. Just look around you. Hone your senses. And even if you are spending hours browsing around for ideas on Pinterest, you can always turn yourself into a Pinterest Board. Remember, it’s all a matter of looking at things from a different angle. If you’re still stumped after spending time browsing around your physical world, then, of course, browse the engines for more inspiration. How much money you’d like to spend? Click “Submit” and then get a list of ideas – that’d be AWESOME, wouldn’t it?! Well, guess what? It exists! Right here on this site. Since we’ve got so many costume on this site, I had a tech guy program a tool to help you browse through the costumes here based on your criteria. It’s a fun and free tool. I call it the Brainstorm Wizard (I probably could be more creative with the name…), but it’ll for sure help bring up ideas that may spark that special one you’re looking for. P.S. When it comes to searching for the best Halloween costume idea, I love simple, out-of-the-box costume-making! I built this site to help others find their inspiration for DIY costume-making and share it with fellow costume-enthusiasts.